What is Qi or "chee" wireless phone charging? Qi might just be the next big thing in in-car technology. The first thing you need to know is that it's pronounced "chee", which makes it sound more like a form of mild, medicinal Asian quackery, and less like someone trying to charge you for watching a Stephen Fry quiz show. Qi is apparently a common term amongst those learned in the ways of karate or acupuncture, but it's more modern common usage will soon be as a brand-name for a form of phone charging without wires. So far, this mainly means a flat storage pad between the front seats of your new car where you can charge your phone simply by sitting it there, with no annoying cables required. Qi, or chee, means wireless charging, and it might just be the next big thing. To get a bit technical, Qi wireless charging works on the theory of electromagnetic induction. Basically, when current flows through a circuit, it produces a magnetic field that runs perpendicularly to the flow of the current. So, if you ran a cable flat along the floor of your house, it would send a magnetic field towards your ceiling. Where it gets interesting is that when you place an unpowered electrical circuit in a magnetic field, the field causes a current to run through the otherwise unpowered circuit. So, if you hold a powered circuit next to an unpowered circuit – at very close range, so the magnetic field doesn't dissipate – you could induce current flow without ever connecting the circuits. Sadly, Qi doesn't quite carry enough of a kick to power up flying cars, because the wireless charging standard is so far limited to just five watts. Think tablets and telephones, not cars piloted by mad scientists. There are higher-powered Qi-branded options emerging, which is where things get exciting for home use. The 120-watt 'medium power' Qi standard means that you could wirelessly power a computer monitor, laptop or small stereo. The 'high power' specification can handle 1kW, which is enough to power large appliances (presumably mechanical bulls). Boffins are hard at work scaling the technology up in order to handle bigger power loads, but it's here that the problem with wireless charging manifests itself. Figures vary, but it's generally accepted that Qi gives up about 10 per cent charging efficiency when compared to a copper cable. The bulk of that is wasted as thermal energy – or heat - and the higher the power transfer, the more energy is wasted. However, should you own a Tesla, an American company is already taking orders for a scaled up Qi pad on the floor of your parking space, allowing you to recharge your Model S without cables. In the case of phone charging, for those who are fans of the technology but don't want a Toyota Prius or a Lexus, there are aftermarket Qi chargers that run from USB and 12V ports in regular production cars. Not so fast. For now, residents of Apple World will need to buy a special adaptor for their iPhones before utilising Qi charging, because Apple devices don't come with the system built in (Apple does not play well with others). This will doubtless cue endless smugness from Android and Windows Phone nerds, who have had the tech in their phones for years. Not every Android- and Windows-powered phone has the wireless-charging capabilities, however, so if you're in the market for a new phone and are keen on the technology, check the spec sheets first. Where will I see Qi charging first? Tech-focused Virgin Airways has already rolled out Qi hotspots at major international airports and IKEA is already selling tables with Qi charging points built in. The Prius isn't the only Toyota to feature Qi, with wireless charging points fitted as standard to its upmarket Lexus models. In Australia, it's only available in two Lexus SUVs – the NX and LX. Qi has also found its way into the American-spec Camry and Avalon sedans and Tacoma truck. Other car makers, such as Audi, BMW, Jeep and Kia are also beginning to feature Qi wireless charging, despite Apple's choice to leave it out of its phones. Will there be other wireless charging devices? In a word, yes. Just because a standard has been established, don't expect everyone to accept it. Look to the other format wars – Betamax versus VHS or Blu-Ray versus HD-DVD. There are other brands with their own catchy names and standards, such as AirFuel, which use much the same technology in similar and entirely incompatible ways. To get around it, some phone manufacturers, like Samsung, have installed a charging system in their mobile devices that's compatible with AirFuel and Qi. Eventually, however, the axe will fall and leave just one charging standard (possibly one that Apple invents). Until then, everything is centred around Qi. 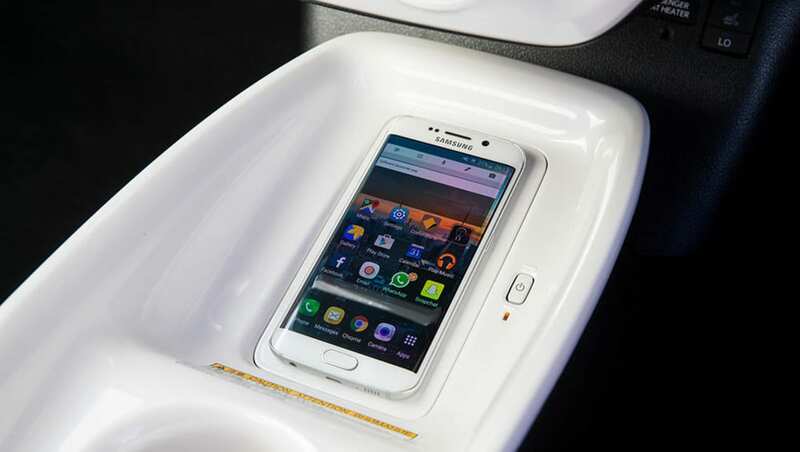 Is wireless phone charging a must-have feature for your next car? Give us your thoughts in the comments below. Volkswagen I.D. ROOMZZ concept a self-driving "lounge on wheels"